All roads lead to Pittodrie on Sunday as we head to Premier league side, Aberdeen for our William Hill Scottish Cup 5th round tie. Our most memorable game against the Dons came in April 2008 when we beat them four - three in an astonishing cup semi-final at Hampden Park. 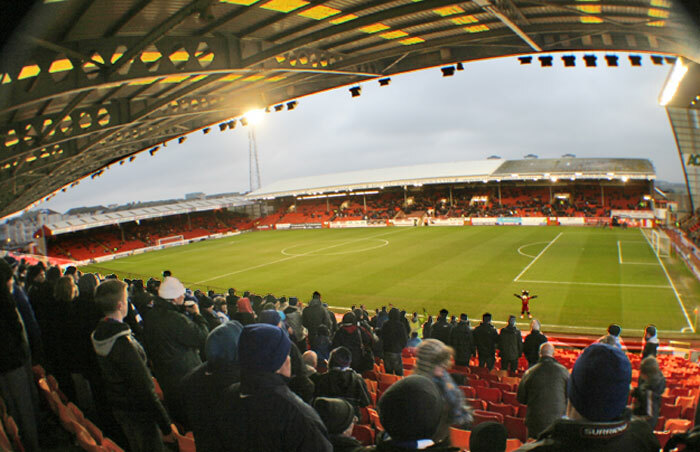 However, our last meeting was in February 2012, also in the Scottish Cup when we lost two - one at home in the replay after holding them to a one all draw at Pittodrie. In the first game, Scott McLaughlin had given us the lead but Scott Vernon forced a replay in Dumfries. When Ryan McGuffie cancelled out Fraser Fyvie's opener only for Andrew Considine to score an injury time winner to knock us out of the cup. Queens boss, Gary Naysmith has fond memories of the year he spent with Aberdeen but is looking to get one over on his former manager on Sunday. "I don't have a bad word to say about Aberdeen, I loved my time there, they put me up in a flat in the city and I enjoyed getting out meeting the fans and things but I was coming to the end of my career and although I enjoyed the three or four months I had under Derek when he was manager, my body was giving up and I couldn't play the way he wanted me to as he reshaped the team and it was time for me to move on. Although Derek was the manager to free me if you like, I have the utmost respect for him and believe the work he and Tony Docherty have done at Aberdeen has gone unnoticed and is now taken for granted. This weekend we take a break from the unforgiving Championship and have a massive cup tie to look forward to. There is no hiding from the fact that we were below the standards we have set for ourselves at Falkirk last week and we were off it all over the park. I'm still unhappy with our level of defending but we have put the overall lack of energy down to fatigue and still believe the three games in the space of a week took its toll on us. For the past few seasons, Aberdeen have been the second best team in Scotland, so we can't under estimate how hard its going to be, but cup upsets do happen, just look at Newport County against Middlesbrough. For it to happen on Sunday we need to be at our best and we have prepared as much as we can. We have done our homework, we have watched Aberdeen and I went up to watch them on Wednesday against Rangers. We have tried to work out any weak areas that we can exploit, they don't have too many to be fair, so yes we will be underdogs but I'm sure Derek will have watched our recent games and won't be under estimating us either. We are a small squad but we all muck in and have a really strong bond and that has been to our advantage this season. We have shown we can compete with teams from the Premier league already as we took St Johnstone all the way and we have shown we were the better team against Dundee over two games in the last round so the players can take confidence from that. We are going up the night before and we will be having a pre-match meal etc, that gives you a good feeling, the sense that its a big game. It's on TV in front of a decent crowd so of course they will have butterflies but the boys should embrace it rather than worry about it. We have several players missing or carrying knocks so it will be Saturday before we can finally pick the team. Nicky Low (groin) and Michael Doyle (hamstring) missed the game at Falkirk and I have no idea yet if they will be fit to play on Sunday. Callum Fordyce has played the last two games despite his ankle injury, again we will have to wait and see how he is. Josh Todd hasn't recovered from the knee injury he picked up against Partick Thistle and will definitely be missing. Along with Darren Brownlie who is on his way back from his cruciate injury but needs game time. And Iain Wilson who joined on loan from Kilmarnock is cup-tied having played for the Rugby Park side in the last round". Queens fans have been allocated sections P, Q and R in the South Stand. Entry is via turnstiles on Golf Road. QoS supporters will be able to purchase tickets at the turnstiles on the day. There will be no advance sale of tickets from Palmerston. Please note disabled and wheelchair users will also get a complimentary carer ticket too. However these need to be purchased from the Aberdeen Ticket Office either on the day or in advance by phone on (01224 631903). You cannot sort out disabled tickets at the turnstiles directly. Kick off is at 3:30pm on Sunday and the match will be live on BBC Scotland television with live commentary on BBC Radio Scotland as well.